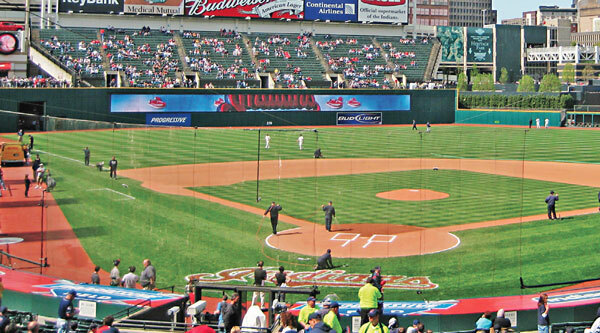 Promats Athletics uses NET Systems’ Ultra Cross knotless netting made with DSM Dyneema’s Black Dyneema® fiber in ballpark installations that provide invisible protection to fans sitting closest to the action. This season, many major and minor league baseball fans are enjoying a new level of nearly invisible protection from foul balls and other such hazards, thanks to ballpark installations of extended netting systems made using the Netherlands-based DSM Dyneema’s Black Dyneema® ultra-high-molecular-weight polyethylene fiber. Promats Athletics LLC, Salisbury, N.C., designs and installs the new systems using Ultra Cross Black Dyneema knotless netting manufactured by NET Systems Inc., Bainbridge Island, Wash. 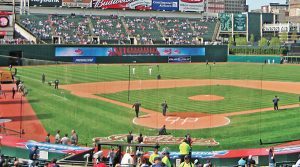 The Ultra Cross Black Dyneema® knotless netting protective system does not interfere with the viewing experience at the Cleveland Indians’ Progressive Field. Until recently, ultra-strong, -lightweight, and abrasion- and ultraviolet-resistant Dyneema fiber was available only in white and had to be coated if color was desired. However, coatings don’t stick easily to the fiber’s slick surface, and they eventually wear off. In response to customer requests, DSM developed a way to essentially dope-dye the fiber, and late last year debuted Black Dyneema, which exhibits the same performance properties as white Dyneema. According to Ken Giese, responsible for application development technical service, Commercial Marine & Sports, the company has seen enough demand for the black fiber to dedicate one production line to its manufacture. “Black appears to be very popular,” Giese said. “We’re finding a lot of new applications and end-uses.” Giese noted performance apparel in addition to sports and fishing applications. NET Systems is the exclusive US manufacturer of Ultra Cross netting, which has a four-strand braided construction. Since the 1980s, the company has supplied Ultra Cross to the fishing market, but over time, it has branched into aquaculture, sports, defense, entertainment and industrial markets as well. The braided netting is thinner, less visible and more durable than knotted netting, which is prone to failure at the knots. Promats — a manufacturer of protective padding, netting systems and other products for sports facilities — has an exclusive arrangement with NET Systems to supply Ultra Cross for the baseball stadium market, and also is installing such systems in football stadiums and college football training facilities. For more information about Black Dyneema®, contact Ken Giese ken.giese@dsm.com; UltraCross, contact Dan Oliver dan@net-sys.com; and Promats Athletics, contact Matt Cross mcross@promatsathletics.com.